For some people, bunions can be painful with physical activity or walking. For others, bunions are distasteful deformities that make it difficult to fit in shoes. 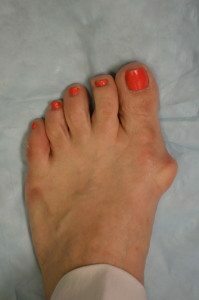 Bunions can advance into painful arthritic foot conditions and so it’s important to seek professional treatment early. Our professional staff here at the Advanced Foot and Ankle Institute of Georgia is trained to effectively treat this disorder and allow patients to return pain free to walking and physical activities. Protective silicone padding will reduce friction generated from the toe rubbing from the shoes. Shaving down corns or callus associated with the deformity. Wearing accommodative shoe gear that fit the enlarged portion of the foot. Most patients will have to obtain shoe sizes that are usually wider than current shoes. Custom orthotic devices help to correct the abnormal biomechanical forces around the foot and work to reduce the severity or slow down progression of the bunion. Splinting devices to reduce the drifting of the great toe to the second toe. This is usually worn at night. In severe cases, conservative methods will not work and bunion surgery is needed to correct the deformity. There are several procedures to correct bunions and the severity of deformity will determine which procedure is appropriate in each case. Please call our office at (678) 679 3300 or book an appointment online today for consultation on your bunions.